Quercitron has been used since Prehistoric times. It is extracted from the bark of young oaks from the Black Forest. This pigment is very suitable for dyeing wool and natural tanning of leather. It is a brownish dye, the intensity of the color is largely determined by the stain. 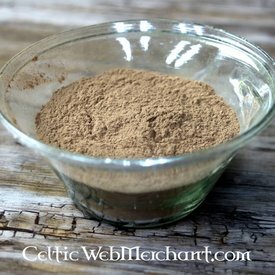 This pigment was already used by the Celtic and Germanic tribes and remained in use until the 18th century.